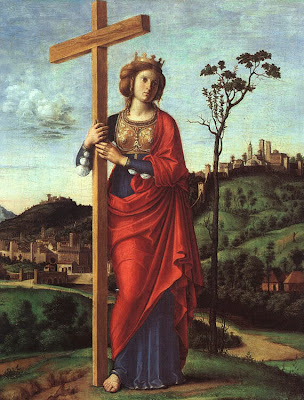 The feast of St Helen is a 3rd Class feast in Liverpool and Salford, and St Helen is the co-titular of Brentwood Cathedral, so it is celebrated in that Cathedral as well (First Class). St Helen, the finder of the True Cross and mother of the Emperor Constantine, was, of course, said to be a British princess. Britain played an important part in her son's life, since he was proclaimed Emperor at York; he went on to vindicate his claims in the ensuing civil war, and make Christianity the official religion of the Roman Empire. Evelyn Waugh's historical novel 'Helena' is a thoroughly enjoyable re-telling of St Helen's legend. St Hilda (Westminster, Birmingham, Clifton, Northhampton, Nottingham, 17th November). Others I have found I will publish in due course. I have spent some time recently researching feasts proper to England and Wales in the 1962 Missal. There are feasts proper to the whole of England and Wales: nine, to be exact, including St George (April 23rd) and the Martyrs of England and Wales (May 4th). There are also, listed conveniently in the Baronius Press hand missal, pages and pages of feasts not in the Unversal Calendar of the Latin West, and not celebrated in the whole of England and Wales, but still celebrated in certain dioceses in England and Wales. These feasts become problematic when they have special texts composed for them. The texts themselves are not difficult to find - diocesan supplements for the altar missals exist, and they are all there in the Baronius Press missal - but when the text need to be sung, one needs to have the chant setting. And these do not seem to be widely available, if at all. Of the feasts of the whole of England and Wales, a full 'missa propria' was composed for 'BB Joannis Fischer et Thomae Morus': that is, Bishop John Fisher and Thomas More, when they were beatified in 1886; the feast was originally celebrated on 4th May. This Mass, 'Deus venerunt gentes', stayed on 4th May when SS Fisher & More were canonised and moved to July 9th (getting a new Mass formulary), and 4th May became the feast of the Blessed Martyrs of England and Wales. I have found it in the English Benedictine supplement included in a 1908 Schwann Graduale and a later Solesmes Graduale, both of which I have been able to scan. It is a 3rd Class feast. Here is the Introit being sung by the Schola Abelis of Oxford; there are more videos of the propers of this Mass here. All sorts of things can be found pasted into the back of old Libers, or loose within its pages: St Joan of Arc, St Joseph the Workman, and other things obviously added to the calendar since the date of the printing of that particular Liber. Clearly these little booklets were made available when the Mass texts and melodies were published. What I have never seen, however, in an official supplement or pasted in somewhere, are the proper chants for diocesan feasts, in cases where these are not simply borrowed from other feasts and commons. I shall be posting about some of these later. 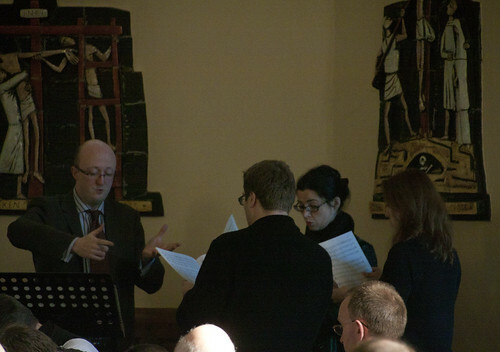 Nearly two years ago, on January 30th 2010, the GCN was launched at a meeting at the London Oratory, attended by representatives of about two dozen chant scholas and a number of people involved in singing or teaching the chant. We agreed at that time to have such a meeting every two years. The launch meeting was widely reported and was addressed by Colin Mawby, the distinguished composer and former Director of Music at Westminster Cathedral. The next meeting is now well in preparation, and will take place on Saturday, 18th February 2012, at the London Oratory (the St Wilfrid Hall and the Little Oratory). It will be addressed by James MacMillan, another Catholic composer deeply concerned about, and practically involved in, chant. The Apostolic Nuncio, Archbishop Mennini, will join us and lead Vespers in the Little Oratory. The meeting is an internal meeting of the GCN and as such it is invitation only. The directors of all our affiliated choirs and scholas are automatically invited, as are representatives from our 'supporter' organisations: the Latin Mass Society, the Association for Latin Liturgy, the Schola Gregoriana, Una Voce Scotland, and the St Catherine's Trust. Others involved with the chant have been invited as before. Anyone with a Catholic choir or schola can naturally get an invitation by affiliating. For those who have received invitations, don't forget to reply! 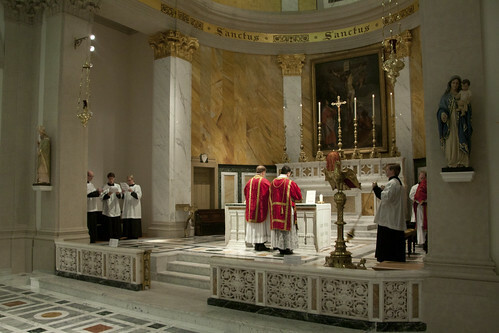 The Juventutem London Schola, in the sanctuary at St Patrick's Soho Square. The Juventutem Movement is an international movement of young people attached to the Traditional Mass, a phenonemon observed by the Holy Father when he wrote that 'young persons too have discovered this liturgical form, felt its attraction and found in it a form of encounter with the Mystery of the Most Holy Eucharist, particularly suited to them.' The movement has groups in a number of towns and cities around England, and a particularly active one in London. One of the features of the group is a particular love of Solemn Mass, ie Mass with celebrant, deacon and subdeacon. It should always be remembered that, although Missa Cantata and and Low Mass are indispensible elements in parish life, it is Solemn Mass which is the normative form of Mass, giving it the full honour which is its due. Solemn Mass in the Extraordinary Form is extraordinarily beautiful, with many ceremonies which are cut down, or omitted, in Missa Cantata. Obviously a choir is necessary for Solemn Mass, and after some experimentation and development (including a couple of Masses accompanied by the Schola Abelis, who had travelled from Oxford for the occasion), the London Juventutem group has now established a schola of its own, which even has a blog. Polyphonists at the LMS Pilgrimage to Aylesford, with the Juventutem London Schola. Its director is Matthew Schellhorn, a professional pianist and the Latin Mass Society Representative for Southwark North. The Juventuetem Masses are monthly, on the last Saturday of each month, and alternative months are sung with polyphony. The core of the choir is however a small chant schola, led by Matthew and drawn from the young congregation. They can also on occasion sing elsewhere, and did so at the LMS Pilgrimage to Aylesford. They have joined the GCN and have been added to the list of affiliates and the map. 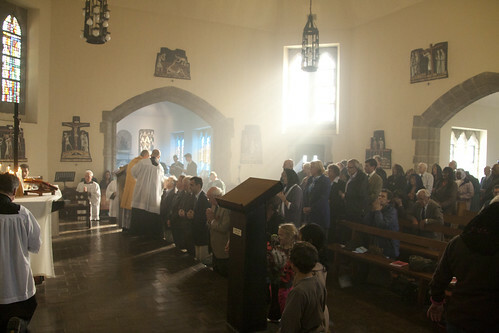 The chant schola singing during communion at Aylesford (at the back of the photo). Juventutem London is now established at St Mary Moorfields, 4-5 Eldon Street, EC2M 7LS, and their next Mass will be there at 6.30pm on December 23rd. 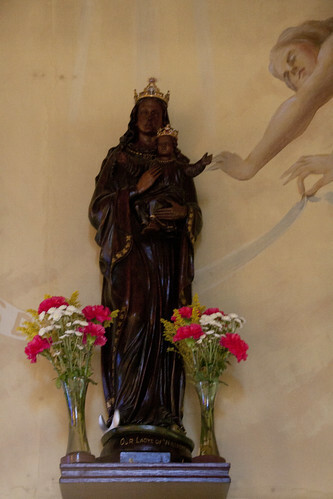 Our Lady of Willesden. The shrine image is carved out of a medieval timber from the ancient shrine, and crowned by Papal mandate. One of England's great medieval shrines, it was re-established in the 20th Century. Christopher Hodkinson, well known as a leading member of the Schola Gregoriana of Cambridge, has founded a new schola, the Anglorum Chorus. This sings at both the Extraordinary and Ordinary Forms of the Roman Rite, and is based in the South East, though they will go anywhere where travel expenses are available. One of their first Masses was for the Latin Mass Society Annual Pilgrimage to Willesden on 29th October. They have also sung for the Ordinariate of Our Lady of Walsingham. The schola has joined the GCN and been added to our list of affiliates and the map. You can use this email address to contact them: anglorum.chorus@gmail.com.